Season 9 continues to be great. 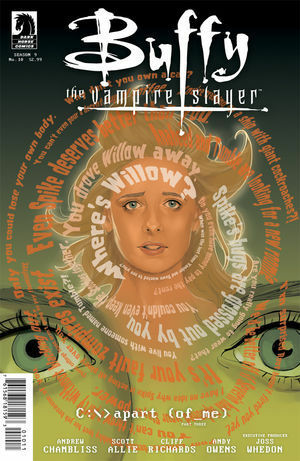 Glad to see Buffy moving forward in this issue and again trying to figure her life out. Not really thrilled to see Simone again but I understand she is an issue that needs to be dealt with, so it makes sense. Okaaaay...I'll be interested to see how this all reads together, as one story, when the run is finished. Because, at the moment, I feel like we could've got to this point without the whole (view spoiler)[pregnancy/robot (hide spoiler)] diversion that was a little...odd. This issue was okay, it felt very rushed to get to the end of this trilogy arc leaving quite a few details out as the resolution came about. I am still intrigued to see where this Season is heading, but this issue just seemed to be missing something. Argh where is this going? Ohohohoh does the paper left for B. have something to do with Will appearing in Angel & Faith?Also, Spike, I think you're going to regret that. So happy this arc is over. Wasn't my favorite. Andrew Chambliss Scott Allie Cliff Richards Joss Whedon - Andrew Chambliss is an American television writer and producer. He is well known for working on series such as Dollhouse, The Vampire Diaries, and Once Upon a Time.